CROWN POINT, Ind. -- A northwest Indiana museum dedicated to a popular Depression Era gangster was shut down almost as suddenly as its namesake was taken out leaving a Chicago theater more than 80 years ago. 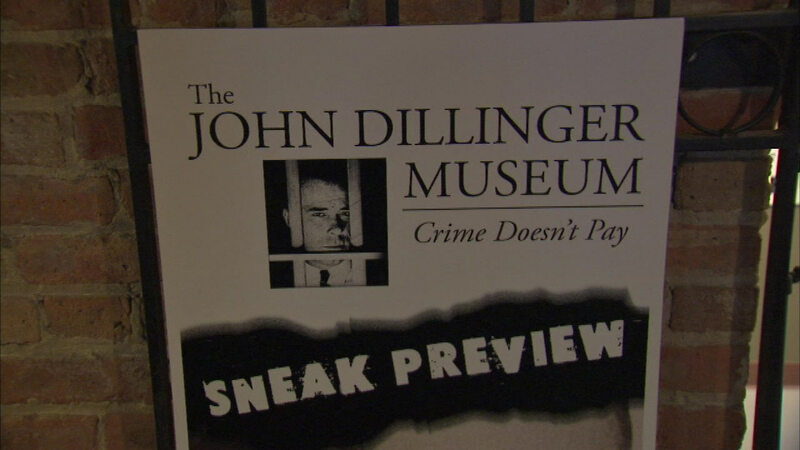 The John Dillinger Museum in Crown Point, Indiana "permanently closed its doors" at 11 a.m. Thursday, according to the South Shore Convention and Visitors Authority, which made the announcement in an online posting. The museum, which moved to Crown Point from Hammond in the summer of 2015, had "welcomed approximately 20,000 people from around the world, made national headlines, and has been featured on major news networks and the Travel Channel," according to the statement, which did not give a reason for the closure. Asked if the move was financial, CVA spokesman Erika Dahl said in an email, "The decision was not made lightly, and we have been very impressed with our attendance numbers." The city had hosted a number of special events "to increase visitation at the museum and the city's downtown, including a public viewing of the infamous wooden gun, screenings of the movie, "Public Enemies," and special admission promotions," the CVA statement said. "The museum was purchased by our organization in the '90s with the intent of educating the public and drawing in visitors," Dahl said. "We feel it did both of those things." Asked if the museum might open in another location, she said, "Unfortunately, I do not have any updates at this time on the fate of the museum ..."
And asked if the historic collection, purchased by the CVA in the 1990s, would be maintained, or possibly split up and sold, she said: "At this time, I'm not sure. We are open to all possibilities." Crown Point Mayor David Uran called the museum "an asset to Crown Point's downtown as it generated additional foot traffic to our local merchants and brought in visitors from across the nation that may not have normally stopped in Crown Point. "The museum not only economically helped our city, but it raised the awareness of how law enforcement evolved and made advancements in their crime fighting techniques which created new ways to protect communities," the mayor said. The one bright spot in the sudden closing is that no jobs will be lost. "Our staff also works in our gift shop and welcome center in Hammond," Dahl said. "They were trained to do all three jobs and would bounce back and forth from location to location." Crown Point will still have its Dillinger connection, as he escaped 1933 from the old Lake County Jail, now home to the The Old Sheriff's House and Jail Museum. The museum featured historic artifacts from the days of Depression Era gangsters, including photos, clothing, weapons and other items; and also detailed the rise of the FBI during that same period. The museum also housed a memorial to local law enforcement officers who died in the line of duty. But the focus, and several rooms of exhibits, were dedicated to Dillinger, perhaps the best-known gangster of that era before he was gunned down outside the Biograph Theater in July 1934, an end just as shocking as that of the museum.